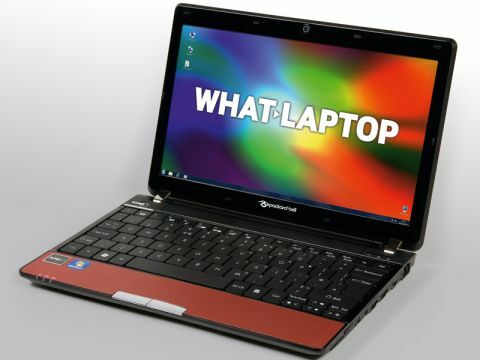 Despite the Packard Bell dot a being marketed as a netbook, it has more in common with a CULV laptop, thanks to its large screen size and (relatively) powerful processor. Nevertheless it makes a stylish, if unspectacular, option for those after a portable partner at an affordable price. The first thing to note is the design. The 'Kashmir Red' finish features a wave pattern across it and is likely to attract and repel in equal numbers. It's very hard to scuff or scratch, however, making it easy to keep clean and great for those who regularly travel, but need to present to clients in style, for example. The 11.6-inch screen features a 1366 x 768-pixel resolution which is extremely sharp, but such a high resolution in a screen this small does make the menus and options quite small, which may infuriate those with poor vision. The panel is also quite dim and those who work under bright lights might find this irritating. The spacious keyboard is very flat, making it quite easy to get lost when typing, and the travel is very shallow. This might not put some off, and we got used to it fairly quickly, but we would recommend you aim to try before you buy in your local superstore if possible. The touchpad features multi-gesture functionality, but is disappointingly small and there's very little room to actually carry out gestures with any real ease or accuracy, reducing usability. An AMD Athlon II Neo K145 processor runs the show and, although there isn't enough power here to multi-task numerous applications at one time, those looking to run office programs and carry out basic tasks, such as listening to music, will find there's just about enough power available. Similarly, the integrated ATi Radeon HD 4225 graphics card employed is great for photo editing and streaming films, but more resource-intensive multimedia tasks, such as film editing, are not possible. Nevertheless, this shouldn't prove a problem for those simply after a small machine to accompany them on business trips. Portability is average and the 1.3kg chassis is no problem to carry around for extended periods of time. The battery life of 281 minutes is unspectacular and means you can leave the office for only a few hours without the power charger. Although there's no optical drive for burning or watching DVDs, a nice feature is a dedicated social networking key, which gives you quick access to the likes of Facebook and Flickr websites for keeping up to date with friends and family. Despite a few design anomalies, the Packard Bell dot a is a decent laptop for those always on the go, and we particularly like the social networking key.